I wish to express myself to them through my work. Graduated from Secondary School attached to the Faculty of Education of The University of Tokyo. Chooses “Edo Sashimono” for Upper Division Graduation thesis. Graduated from TASK in Sonobe, Kyoto, Wood Sculpture major. After visiting him multiple times to ask to become his disciple, Otake begins studying with yew wood carver (ichii itto), Katsuhiro Higashi, who produces works, from small sculptural objects (netsuke) to decorative transoms (ranma). Receives First Prize at Netsuke Invitational Exhibition, Japan Wood Sculpture Netsuke Art Festival (2010), after training for one year and a few months. Marvelous Transcendental Skill! From Meiji Craft to Contemporary Art, Mitsui Memorial Museum. Art Collectors', Sep. 2014 Issue, “Fun Encyclopedia of Fine Art”, article, interview with Fuyuki Maehara. The Window of Arts, Sep., Oct., and Nov. 2014 Issues, “This Month’s Hidden Ball”, articles. Complete Collection of Japanese Arts 20, “Present and Future of Japanese Arts”, “Ise Shrimp (I)” published. CENTURION SUMMER, 2016 Issue, “Evolving Forms”, article. 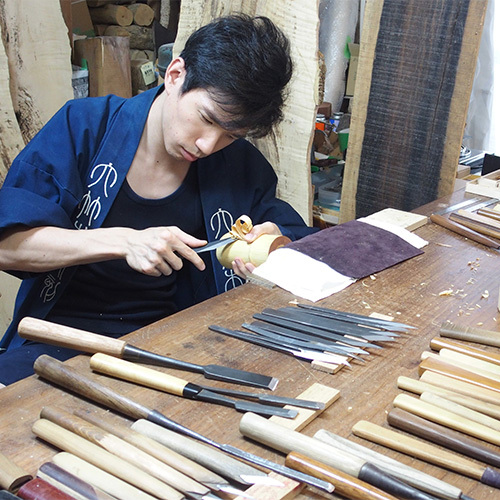 Admiring wood sculptures from a young age, Ryoho Otake bought an expensive carving blade with the money he received for the New Year from his parents, and used the blade to carve into his desk at school. Otake, who said that the teachers could not get angry at him once they saw his level of craftsmanship, is a wood sculpture master through and through. In 2009, instead of going to an arts school, he graduated from the technical school, TASK, and with a need to further master the skills of wood sculpture, became a pupil of Katsuhiro Higashi, a teacher who created wooden relief sculptures (miyabori) in Hida-Takayama. He became independent from his teacher after about 3 years of training. Later, he began to produce life-like (jizai) works, by carving marvelous work out of a single block of wood, alongside using his own completely original wood sculpture techniques. COPYRIGHT © 2017 Ryoho Otake ALL Rights Reserved.